I love designing, but you gotta capture the design in a concrete way which means a lotta synthsising of key elements, features, contextual linkages, pattern ah-ha’s which all needs to be succintified, captured, edited, refined, described, clarified. I love explaining the complex in a visual, but getting to the final graphically designed visual takes time, and mousing, lining up, and saving often, and resizing, and sourcing imagery and inspiration and making icons. And then taking a look and realising it’s unreadable, and adding a few lines and boxes. And then transferring it to an already MB-full document. So some more resizing, and wondering what the hell to do. And then googling and working it out. So, I love and hate this time. You’ve done all the fun talky whiteboardy stuff. Now it’s time to get your define on. We work mostly with Public Sector clients. They get a lot emphasis on *A LOT* of words to read; tables and matrices, paragraphs, bullet points – pages and pages of it. Prose and composition and narrative take time to craft, to take in, to agree on. So for a change I’ve been leaning quite heavily on sketching to draw out process changes. Informal discussions where “bright ideas’ may evolve naturally. We use this sketchy approach all the time during the exploring and designing phase. But using it for final clarifying to the defining stage is new for me. Bourne out of necessity – too much on, too much to take in (client-side, my side), wanting to allow the client to be able to contextualise the multiple series of decisions we’ve been making together all along but now we’re in the final act. The result has been great. Couple of times even greeted with a “great!” and a generous lean in and casting aside of reports. (It’s very nice as a designer when the new way of looking at things to a client is actually enjoyable and a relief to them from what they’re used to). 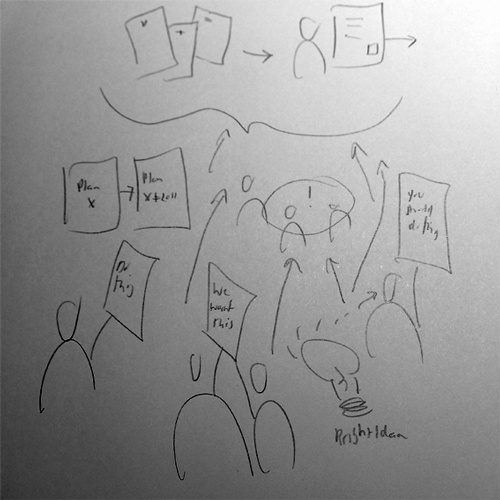 This sketching has also meant turning these conceptual views into the experience maps, and blueprints, and diagrammatic representations and frameworks has been much easier for me. Just like the conversation is often designing. It’s true also that when you sketch you’re designing. That means when I’m using Illustrator I’m designing too. As painful as it can be to start on a blank Illustrator page. Because as you’re drawing the person, and thinking how to colour-code them, and relate them on a screen to an icon that represents a touchpoint or a process or a feeling, you’re thinking as if doing – outside-in and inside-out. I’ll admit I’m a bit of a perfectionist on certain things, and digitising a diagram takes time. Plain and simple. That’s not to say I haven’t always, and still don’t feel guilty for taking time to do diagrams or info design. Even if it is my job. I’d say a typical one-page diagram like a customer experience map takes probably 6 – 10 hours. All the refinements are in addition to that. I am surprised how often I finish a diagram and just hate it. I look at it and I think: “that doesn’t work at all!” “It’s going to be illegible to anyone but me…But I’m so sick of it. And the iterations” (yes, people, iterating can be a pain in the arse!). And then a client sees it and says “I like how you’ve represented me there” (as happened recently) or a colleague explains it back to you seeing even more then you realised. That’s cool. My final realisation from this burst of multiple visualising activity has been I am now comfortable with where I need to make a start on a blank page. Start at detail. Start by writing a bullet point list of what the thing should fulfil. Start by writing a story of someone looking at the diagram. Start by crafting the icons on the diagram that represent emotion, or touchpoints, or a spreadsheet. Start by picking a colour scheme in Kuler. Just start, and slowly but surely, it always comes together. And sometimes, if you’re a lucky designer like I am, you get some absolute and genuine pleasure from it. It reminds you why you love being a designer.